The words are translated into seven languages – the main ones spoken by migrant domestic workers who travel to the Mediterranean nation. They greet you at the top of This Is Lebanon’s Facebook page. Hundreds have responded since they began keeping records in June last year, the group says. “We awake to more than 20 messages, from many different countries. They all want help for someone being abused in Lebanon,” Dipendra Uprety, the group’s founder, told Al Jazeera. Uprety, a former migrant worker in Lebanon who once worked at Beirut’s iconic Phoenicia Hotel, founded This Is Lebanon in 2017. He experienced directly the hardship endured by some migrant workers living in the country, of which there are estimated to be in excess of 250,000. These low-income workers come to Lebanon generally seeking salaries to remit to their families back home. Many return broken – physically and mentally, rights groups say. Non-payment of fees, long working hours, forced confinement and no rest days are pervasive, and physical and sexual abuse is prevalent, according to Amnesty International. Uprety himself spent six months in detention, after his employer failed to renew his residency papers. 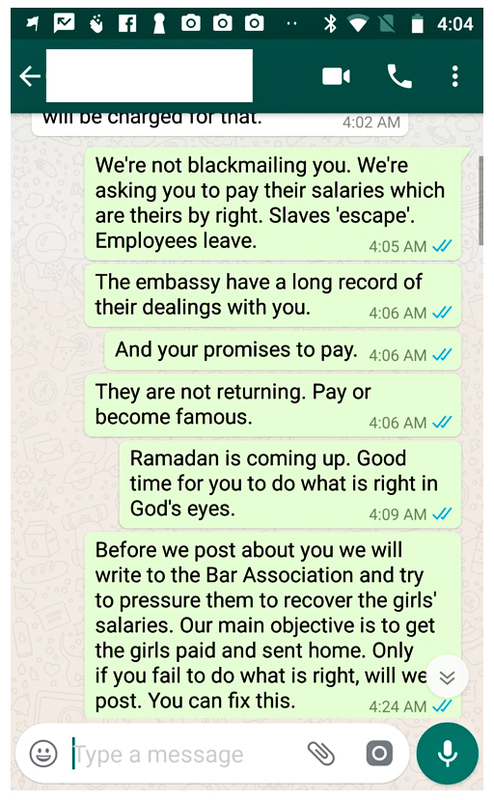 Under the sponsorship system known as Kafala, workers are not allowed to resign, change employers or return home without the consent of their ‘Kafeel’ or legal sponsor. The system is in place in nations across the Levant and the Gulf. Some countries have taken steps to roll it back, with Qatar last year allowing migrant workers to leave without the permission of their employers – though this did not affect domestic workers. Uprety eventually got out of detention, with the help of a local church. He spent time working as a diplomatic attache for the Nepalese consulate in Lebanon, helping detained Nepalese workers. “I had dealt with over a thousand cases. I had a huge headache, we couldn’t get them justice. But when we went to social media, we started seeing results,” he said. Uprety now runs the group from Canada, where he recently attained permanent protected status. This Is Lebanon‘s methods, however, are at times uncomfortable for those on the receiving end of the group’s pressure. They directly intervene with employers when notified of abuse. Depending on its degree, they will publicly expose those accused. Employer: “Yes, no problem I’m going to give it tom- on Monday evening. Are you related to her? Patricia: “No, were activists, “Nashiteen.” … and what about her Iqama (residency permit)? In another example, the case went less smoothly. A separate screenshot shows the lengths This Is Lebanon is willing to go. 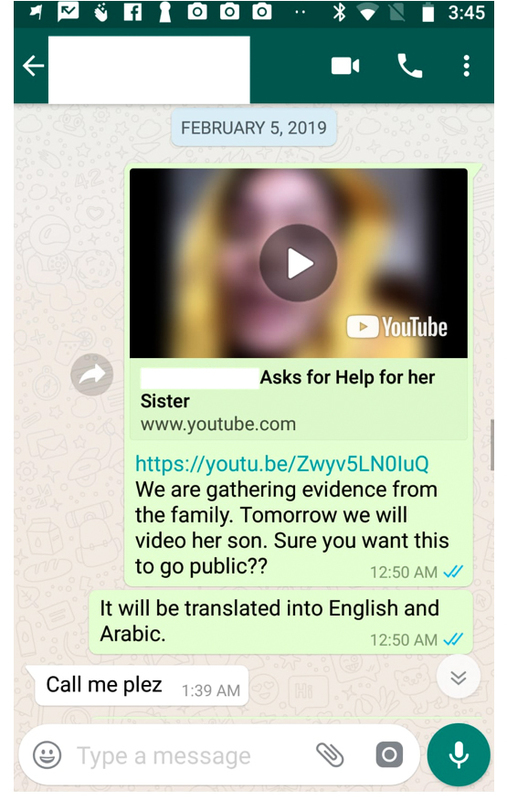 After not responding for several days, the employer is sent a message containing a link to a video recorded by the sister of the domestic worker he employs. This Is Lebanon often posts the results of cases on their page. 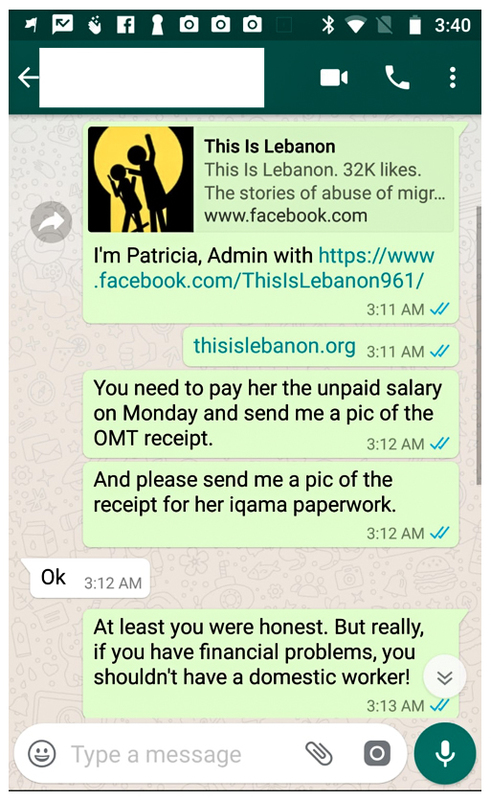 Late last year, a video was posted of a domestic worker who This Is Lebanon apparently helped obtain $10,000 in outstanding salary and return home. “I just want to say thank you for all you did for me when I was in Lebanon … With your help I was able to get back my entire salary, so thank you from the bottom of my heart. In the comments below the video, a domestic worker says she needs help. Her employer is only paying her a fraction of her salary. “What’s your WhatsApp number?” This Is Lebanon comments. That’s how a large chunk of their cases begin. After facing abuse, Uprety says many helped by This Is Lebanon become part of its growing network. Sara has since left Lebanon, and now also lives in Canada, where she volunteers for the group. But she says she doesn’t enjoy being away. “I have no personal life. It always scares me if I want to go and have fun – what if I come back to the phone and there’s something bad waiting for me, someone died or threw themselves from the balcony?” she said. Still, some employers say they have unjustly had their reputations ruined by the group. Jean – not his real name – is one of them. He says his livelihood has been threatened by false accusations that he hasn’t paid his maid, and was keeping her in Lebanon against her will. Upon his request, details of his case have been retained. Jean said This Is Lebanon had tried to establish contact with the domestic worker he employs after she stopped talking to her family and ceased remitting money. But he said the domestic worker had done so on her own volition, fearing that none would be left when she eventually returned to her country of origin. Notary: “Do you want ‘Mr.’ to send money to [country of origin]? She proceeds to sign the document, which is written in Arabic. Al Jazeera confirmed the details of the document, but did not speak directly to the domestic worker. 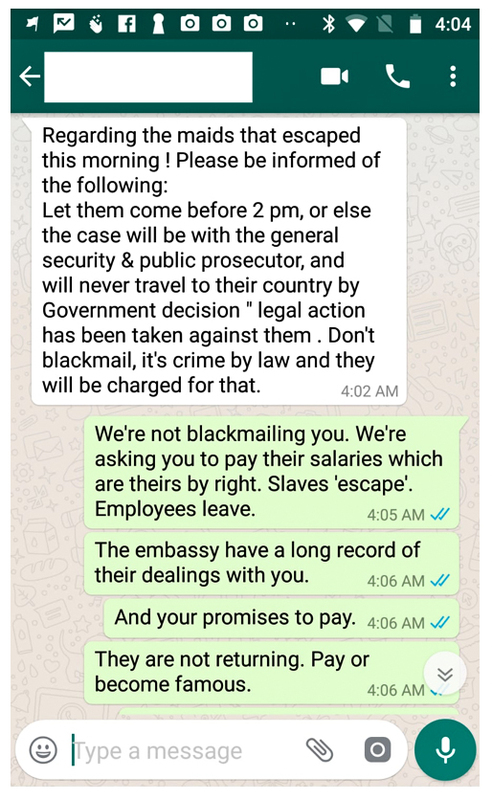 In a months-long public campaign, This Is Lebanon have called on Jean to return the domestic worker home. “I’m sure that some people on this page are abusive, I but I treat [my domestic worker] well,” he said. Asked how he can be sure of the veracity of what he is posting, Uprety responds that This Is Lebanon achieves more justice than the Lebanese justice system ever has – even if mistakes are made. And Uprety rejected the claim that This Is Lebanon has ever falsely accused someone. Lebanese Justice Minister Albert Serhan told Al Jazeera that he was still studying the efficacy of Lebanese courts on cases related to the Kafala system, after recently being appointed to his post. He said he had confidence in their ability to hand down just verdicts, but said he would seek to amend laws where issues are found. “I think there are plans for some changes. Hopefully we will be doing that soon,” Serhan said. A 2010 study by HRW of over 100 legal cases involving domestic workers found “the justice system generally was inaccessible and unresponsive to their demands,” Aya Majzoub, a Lebanon researcher at Human Rights Watch, told Al Jazeera. Majzoub said rulings were obtained in favour of domestic workers only when there was severe physical violence backed up by overwhelming medical evidence. “Anything short of that failed to get the attention of the police and prosecutors,” she said. That leaves a major gap for groups like This Is Lebanon to fill. Indeed, Sara says they are only growing, with round-the-clock shifts in Canada, lawyers working cases in Lebanon, and a network spanning the world.